With proper protection and maintenance, your floors will serve your family well for many years to come. Your new hardwood flooring is a fantastic investment in your home and naturally, you will want to protect that investment! With proper protection and maintenance, your floors will serve your family well for many years to come. Here are some ways you can protect your hardwood from damage! Whether you purchased your flooring pre-finished or you chose planks that will be finished after they are installed in your home, choosing the right finish can make a big difference. Not only will the proper finish and wax keep your floors looking their best, but these things will also keep the wood protected against damage. Another great way to minimize risks to your hardwood is to simply keep it clean. A simple, dry dust mop should do the trick for regular tidying up. When you need something a bit stronger, choose a good quality cleaner specifically made for hardwood flooring. Your flooring contractor will be able to point you in the right direction. 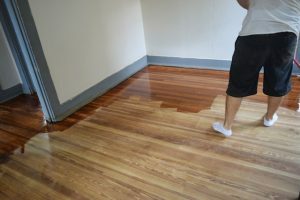 Whatever you do, DO NOT use water to clean your hardwood floors, as water can cause damage. Also, if anything gets spilled on the hardwood it should be cleaned up right away to minimize damage. When avoiding hardwood floor damage, rugs and mats are really helpful. Place a mat at every entry and exit door. Put a runner in each hallway, and larger area rugs in the living room and dining room. Using rugs throughout your home can actually enhance the beauty of your hardwood floors while keeping them protected. Place blinds and curtains on all of your windows to avoid sun damage. Adopt a “shoes off” policy inside your home. It may not be what you’re used to, but in many cultures throughout the world no one wears shoes inside their homes. It may be helpful to place a shoe rack near the front door. If you have furniture that will be sitting on the hardwood, you can minimize damage from scratches by installing felt pads on the “feet” of your furniture. Just be sure to check these regularly, because they do sometimes come off or wear out. This entry was posted on Wednesday, March 21st, 2018 at 2:38 pm. Both comments and pings are currently closed.